The Renegade Craft Fair is back in Brooklyn this weekend and it's taking place at McCarren Pool this year. (In past years it's been in McCarren Park itself.) In any case, the event includes more than 200 booths with vendors from all over the country. 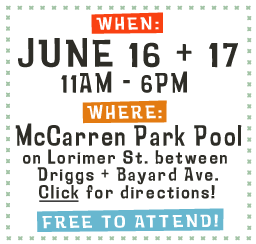 It takes place today (6/16) and tomorrow (6/17) from 11AM-6PM at McCarren Pool. (That's on Lorimer Street between Driggs and Bayard, if you haven't been.) You can check out their website here. Our experience from past years is that there's some pretty cool stuff available.